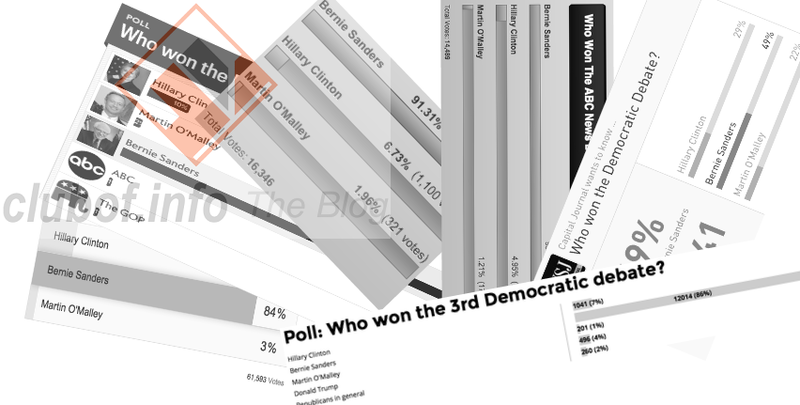 Although online polls show Bernie Sanders winning the recent Democratic Debate of Saturday 19, some media insist instead that Hillary Clinton won. Some news correspondents and apparent experts have been claiming that Hillary Clinton won simply because she knows best about foreign policy, in particular Libya and Syria, which she helped to turn into rubble by advocating US aggression. Clinton's calls for the US to attack Russian and Syrian aircraft with a "no-fly zone" to help terrorists defend themselves in Syria particularly excited some Western journalists, along with repetitions of her arrogant judgment on behalf of Syrians that 'Assad must go'. For these bellicose remarks, journalists seem to love Clinton and have concluded that what the American people want doesn't matter. For them, Clinton must be made President so she can start new wars, attack Russia, and kill more civilians to dignify their arrogance and hegemony. At the same time, all online polls conducted show that Bernie Sanders overwhelmingly won the debate, reflecting that normal Americans are tired of warmongers. Polls conducted at Time, Slate, Fox, ABC , the Washington Times and the Wall Street Journal all showed Sanders winning the Democratic debate by excessive numbers of votes even by conservative viewers. These poll results only come from normal Americans, so they are worthless as as far as top media commentators close to the US regime and the Neocons in Britain and America are concerned. For them, only Neocon extremists and liars are allowed to be winners. For example, the UK's Telegraph presented two "correspondents" as judges of who won the debate, rather than bothering with any kind of online poll. After all, this is Western democracy: who cares what the people think? "Hillary Clinton was the clear winner of tonight's debate", the first said, offering a generic response with no remark on anything she had actually said; "Hillary Clinton was far more accomplished tonight", the second parroted. This may be a sign of how detached from popular opinion some media outlets are. They had handpicked the winner of a debate before spectators of the debate had even cast their votes. They have decided who must be President before any election has taken place. It's as if they were paid to say it, and they probably were. Given the fraudulent and deceitful nature of US electoral tactics, it is highly likely that Clinton will become President no matter what the people want. The election results will magically adhere to what a tiny minority of thugs and millionaires want, as always. If she has the best credentials in the eyes of major news broadcasters and weapons salesmen as a Neocon who can be counted on to start new wars and write new hit-lists, she is perfect for the White House.